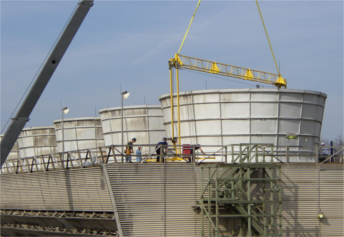 Industrial cooling towers are found across many different industries. One thing they have in common, however, is the need for periodic maintenance. Workers enter cooling tower shrouds to service fan blades, hubs and drive trains, as well as cooling tower structural support members and the cell shrouds themselves. These workers invariably face significant fall hazards due to unguarded wooden or synthetic walking surfaces presenting potential falls of at least 4’ , and often as much as 100’. Moreover, a typical cell environment has a slippery latticework of “two-by” wooden beams at the walking surface, upon which the fan assembly is mounted. These walking surfaces develop slimy green organic growth due to constant rain-forest conditions in the cell. 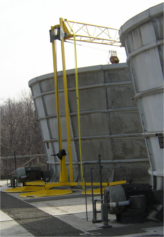 If fall protection has not been addressed prior to shut-down with systems and procedures ready and in place, some facilities have been known to succumb to a Get it Done expediency, with all the potential consequences of injury (or worse). Rescue/recovery can be a challenge if the worker gets caught in the tower structure matrix, or made easier if the worker makes it all the way to ground level. 100% Foot-level Tie-off... This approach is not compliant and could lead to serious injury. 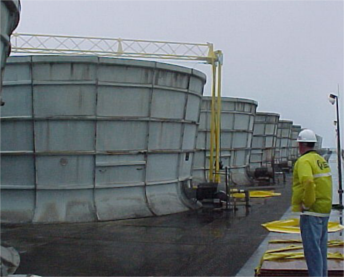 Most cooling towers do not provide the 17’ – 18’ minimum required clearance under a worker’s walking surface to arrest falls using foot-level anchorage. Striking a cross-member or two on the way down could put a damper on one’s day, not to mention the delays in getting medical help when there is no rescue plan in place. Permanent Grating... A great solution at first glance, permanent grating on the floor of the cooling tower cell would decrease cooling tower efficiency due to resistance. Temporary Flooring... 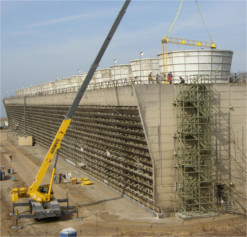 Many sites simply plan on one or more crews of carpenters to build floors in the cooling tower cells before workers enter to do service. First, the carpenters themselves are exposed to some degree of fall hazard, which often is addressed through fall restraint. The floor also usually limits access to lower elevations of the tower. Moreover, floor construction and removal is time-consuming during a shutdown and costly. One case study showed a conservative per cell of cost of ~$2,000.00. CoolingTowerFallProtection’s Cool Gantry... A plant shutdown often involves a crane on site. Simply fly the Cool Gantry into place astride the cell your workers are to enter, pull down the self-retracting lifelines (via taglines) to tie-off, and enter to do work. When done, fly the Cool Gantry to the next cell. Should a worker fall and be arrested, workers can begin rescue with the Cool Gantry’s remote rescue system.